White roses symbolise purity and innocence. Since the vast majority of Australia’s cut flowers are grown using chemicals, however white those darling little buds may be, the last thing they are is pure. If you’re fortunate to live in Brisbane, ‘Flowers of the World’ in Southbank sells pesticide-free flowers. Most people send red roses. That the British Labour Party (along with the Brazilian, Bulgarian, Danish, Dutch, French, Irish, Norwegian and Spanish social democratic and labour parties) use the red rose as their symbol rarely enters the thoughts of most Australians. Down-under, the red rose symbolises something more powerful: passionate love. 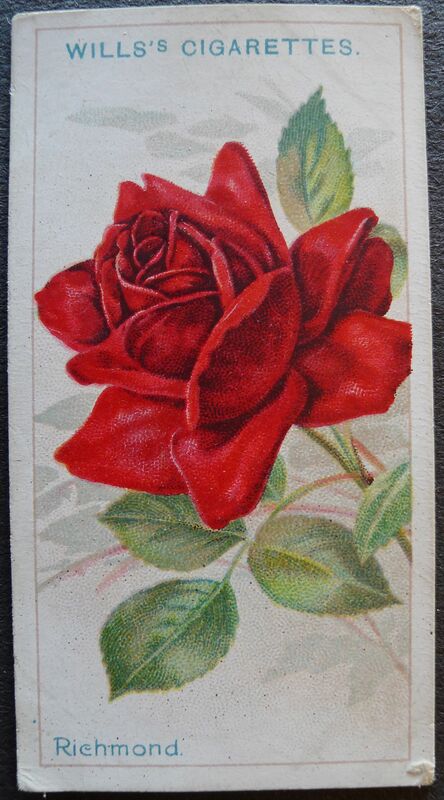 As we head towards Valentine’s Day 2013, I thought I’d publish images of my set of rose cards, produced by Wills’ Cigarettes in 1912. Some of these old cultivars are still available from the Heritage Roses in Australia Society. Many, like ‘The Queen of Spain’, are probably extinct in Australia. If you’re thinking of buying a potted rose to grow in a frost-free garden, the best organic rose growing tip I can offer east coast gardeners is to grow cultivars from these heritage rose groups: Noisette, China and Tea. These groups have China rose genes (Rosa chinensis) in them. Many are richly perfumed. The China rose comes from a climate similar to eastern Australia (warm temperate to subtropical) and is less susceptible than many modern roses to mildew, blackspot and rust diseases. Even during a warm, humid summer they will satisfy. My grandad’s organic rose fungicide formula is now one hundred years old: to 1 litre of water add one level teaspoonful of bicarbonate of soda, two drops of sunflower oil and one drop of dishwashing detergent. Stir and apply immediately. The detergent spreads the bicarb evenly on the surface of rose leaves and the oil fixes it in position for around three weeks. Rose rust, mildew and black spot spores dislike an alkaline leaf surface, so they don’t prosper. Spray before disease symptoms appear and continue spraying every three weeks until winter. If you like heritage roses, try to make it to Sydney’s Rookwood Necropolis. The Friends of Rookwood have saved several of the original roses planted there from extinction. Some, like ‘Captain Rawes’, have been named after the person buried beneath them – there’s little hope of discovering their cultivar names. It seems amazing nowadays that cigarette companies would produce these cards as an encouragement to people to buy the product, but then today look at Macca’s Happy Meals with this or that tacky toy! At least the Wills promotions weren’t aimed specifically at children. Anyway, I totally agree with the sentiment – it took a long time to persuade my son that I’d rather have a Mothers’ Day plant than an expensive, transient bunch of flowers. Thanks for sharing your card collection. thanks for sharing the images on these cards, a wonderful ‘walk’ through old roses. I migrated to Australia as a child and my first ever bedroom in Melbourne had a wallpaper of old roses. I hated it then, but now your cigarette cards remind me so much of that wallpaper and made me think that I probably missed out on learning about the flowers on the wallpaper, since I hated being surrounded by it so much. My parents had rose-covered wallpaper in their bedroom, so this flower is similarly imprinted in my memory. Bless Laura Ashley for giving folk another chance to re-live their childhoods!